Why it has taken me so long to figure this out, I HAVE NO IDEA. We have a lot of kids, which means there are many requests and many voices at the dinner table. In fact, sometimes I’m so sound sensory overloaded at the end of the day I have to turn off the background music. I generally love family style serving but things have to run differently when I’m solo. Even with helper hands, it just takes too many trips to the table to bring each serving dish, plates & utensils, and drinks for everyone. Inevitably, just as I sit down to join the family and take my first bite, I hear “Mama, I don’t have a drink. Can I have some water please”….. this is a cascade and the others come up with their own requests. Let’s just put a disclaimer out there: I am an OT and I preach independence. My kids are pretty independent and very capable of getting their own water. There are also frequent spills. I know spilling is part of the learning process but realistically, when I’m outnumbered 4:1 and I know I have to get them all to bed on my own, I JUST CAN’T HANDLE A PREVENTABLE SPILL. I haven’t even mentioned fitting in home reading, piano practice, nor finding the elusive overdue library book, signing agendas, and filling out forms that they forgot to give me 3 days prior and now they are due tomorrow. SO, I’ve started leaving a pitcher of water on the table, along with glasses next to it. And it’s worked! My apologies if this is common knowledge – I’m just a little slow to the party. Plate kid dishes in the kitchen and each kid brings their own plate to the table. Permanent water pitcher on the table with glasses next to it. Little vase with a bunch of forks permanently at the table. Already, this has prevented at least 3 get-ups for me during dinner. Refills are right there and the kids can do it themselves with less likelihood of spills. Win-win-win! Starting solids can be OVERWHELMING. It feels like you just have things under control and its time for change again! Breast or bottle feeding is well established, nighttime sleep has grown into longer chunks and napping seems to be under some semblance of a routine. Now you are supposed to sit your baby in a chair and teach him to eat from a spoon?! And transition to offering these “meals” after a breast or bottle feed numerous times a day?! There seems to be a lack of specific instructional information out there. The medical community offers little concrete assistance, at least until difficulties arise. The first and only formal reference to the solids transition for us was at my daughter’s 6 month immunization; the only investigation was a superficial, seemingly “check-box” question “are solids going well?”. The feeding support was completed with the provision of a handout. We are told when we should introduce solids, and to do it one food at a time. To the “Introducing Solids” handout developers credit, the of pictures of textures for different stages and the menu suggestions are very useful. It is no wonder that many parents rely on friends, family members and Google as their trusted sources for feeding information. These people, often with good intentions, can offer some great information; they can also perpetuate myths such as babies sleep better with rice cereal in their bottles. Beyond that, there aren’t many ideas readily available for what to do when things don’t go according to plan. Not only that, general handouts often do not explain the rationale supporting recommendations. In the face of conflicting recommendations, an understanding of the rationale can be the compass. Learning to eat is an incredibly sensory experience. This sensory adventure can be stressful for parents and baby. We often fail to appreciate the complexity of this task, expecting baby to instinctively open his mouth for the incoming food-laden spoon. It is a disarming experience to have someone else to feed you. You are vulnerable to the whims of the feeder; they control volume, temperature and rate of spoonfuls. Imagine trying to coordinate your breathing, chewing and swallowing while an insensitive giant automatically shovels mountains of goo into your tiny mouth?! You have to trust that she will know when to offer another bite, when its too hot, when its too cold and when you are full! 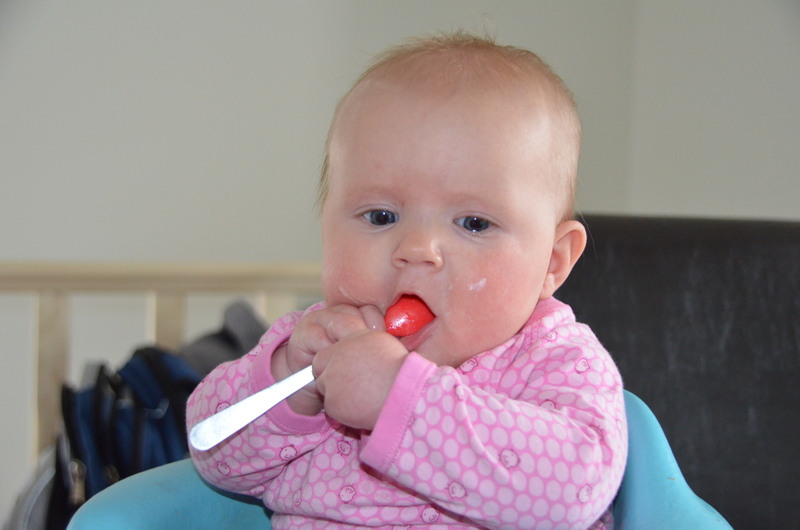 Not to mention that for the baby, every morsel loaded on that spoon is brand spanking new in look, smell, feel and taste! Before introducing solids to your baby, I challenge you to have someone else feed you while you are blindfolded. The blindfold will prevent you from recognizing the food and subsequently preparing yourself for the sensory load. This artificial novelty is meant to mimic a baby’s anxiety with new foods. In this experiment, your feeder should prepare two very different dishes. For example, warm chicken and cold applesauce; foods that differ in flavor, texture and temperature. To create a realistic experience, ensure that you do not know what the foods are in advance. 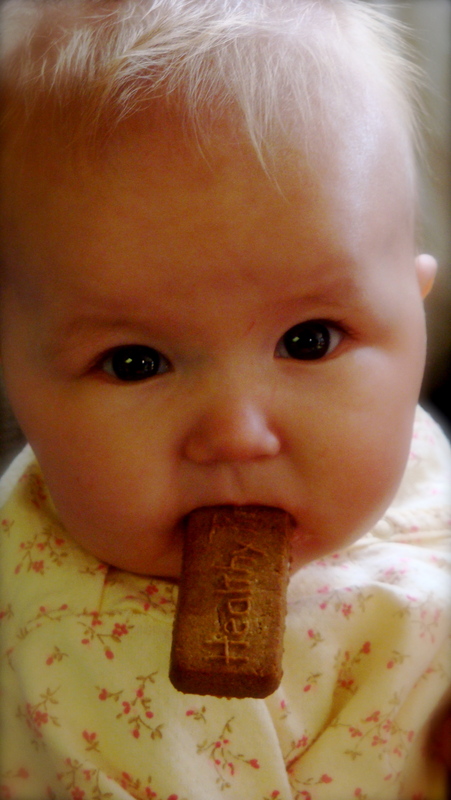 Blind ingestion of varied foods in an unpredictable fashion will help to better approximate a baby’s experience. For this same reason, you are not allowed to speak to your feeder – he must read your cues. You laugh but I think deep down you know why you are laughing…..this is a scary task! You will feel totally ridiculous. Trust me, it will help you empathize when your baby turns his head to an incoming spoon. It will also help you problem solve different strategies to gently prepare your baby for an incoming spoonful or new food. If you are interested in reading about developing a healthy feeding relationship with your child, pick up the book “Feeding Your Child with Love and Good Sense”. The feeding community widely embraces this dietician written book. I have incorporated concepts into my work and home life. Read excerpts of it before you start solids (yes I realize this is nearly an impossible request… hah! Reading… I just started reading again and my second daughter is 16 months old!). Was introducing solids exciting for you? Scary? What do you wish you would have known? More to come….. ideas around when, why and the nitty gritty how to…..plus my favourite places to find new ideas for recipes and foods to try! PS… I’ll take guesses on who is who in the photos! One is F and one is E.